Due to other commitments there was no 2010 event. 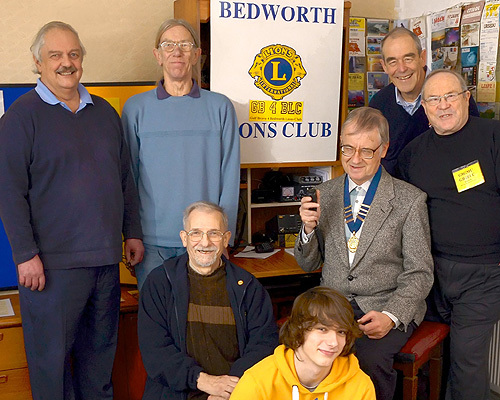 The 2014 official opening of Bedworth lions Awareness Month took the Mayor by surprise as to high tech amateur radio is, he also praised the work of Lions clubs. 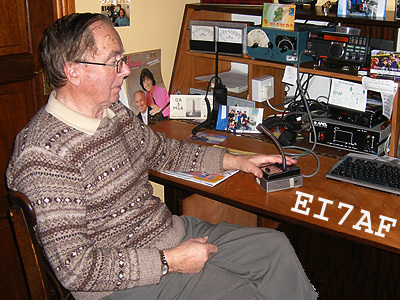 Emphasis was placed on how amateur radio plays its part in social networking. We are again grateful to Ofcom for issuing the special event callsign GB4BLC. Lion Tony, Joshua M3HBM, Lion President Allen, Lion Martin G1ZSR, Mark G4RUN Image by David Monks MBE The 2014 official opening was attended The Mayor Clr.Bob Copland, President of Coventry Amateur Radio Society Graham Wale G4BCG, Lion Past President Allen Farren , Lion Past President Brian G8GMU, Past President Lion Tony Reeve, Mark Beesley G4RUN, & Joshua Baxter M3HBM, Lion Martin Salzman G1ZSR, David Monks MBE. 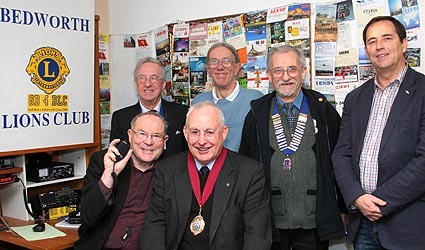 Image by Chris Sidney Photography (G0LXI) The 2013 official opening was attended by President of Coventry Amateur Radio Society Graham Wale G4BCG, Lion Past President Martin Salzman G1ZSR , Howard Jones M0HOW, Lion Past President Brian G8GMU, Chris Sidney G0LXI, Past President Lion Tony Reeve, Mark Beesley G4RUN, & Joshua Baxter M3HBM. Due to several circumstances beyond our control the official opening was as slightly less energetic than usual. This will not reduce the impact this event has in promoting Lionism & Amateur Radio & in the many countries GB4BLC will contact during this event. We are again grateful to Ofcom for issuing the special event callsign GB4BLC. The deputy Mayor exchanged greetings messages with Howard 2E0HOW/M who was located at John Haynes Court, a residential complex named after himself. Residents in the complex heard the greeting messages between Cllr Haynes at GB4BLC & Howard who was braving the cold in his vehicle outside John Haynes Court. Our thanks to all At John Haynes Court for their assistance. The contact with 2E0HOW/M & Cllr Haynes at GB4BLC, interviews with Howard Jones & Jim Lee G4AEH, by David Monks MBE is being played, to listen turn on your sound. Peter G0INS, Howard 2E0HOW, Martin G1ZSR, Jim G4AEH. Brian G8GMU, Deputy Mayor Cllr John Haynes. 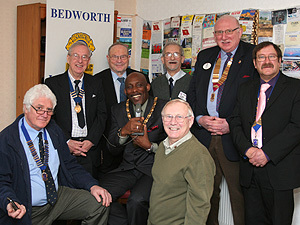 For the 2011 Mayoral opening of Bedworth Lions Awareness month there was a larger 'chain gang' than usual. 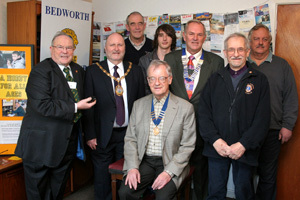 Mayor Cllr Don Navarro (center), Lion President (Bedworth) Eric Tunnicliffe, President of Coventry Amateur Radio Society Peter Yardley G0INS, Past President Lion Brian G8GMU Vice President Martin Salzman G1ZSR Lion District Governor Martin Bye Lion President (Nuneaton)Ian Jackson, (front) Lion Charter Member Steve Allen. During the opening the Mayor exchanged greetings messages with RSGB news reader Martyn Phillips G3RFX, Martyn some years ago had operated as 8P9FX in Barbados. This gave some common ground for the Mayor Don from Trinidad & Martin about which to speak. 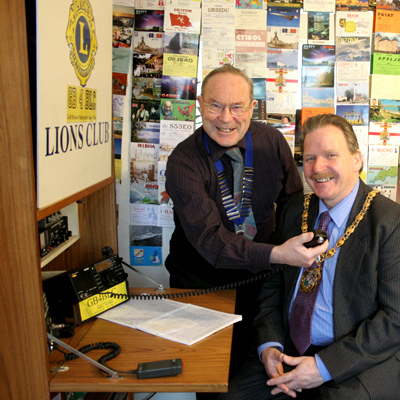 During the 2009 mayoral opening of Bedworth lions Awareness Month, the Mayor exchanged greetings with Robert EI7AF, who is a member of Clonmel Lions Club in Southern Ireland, and also Alan G7CDK who was the recording engineer on Tony Hancock's, The Radio Ham & Blood Donor records. Many other special event stations, and stations in rare locations were contacted during the event. Our thanks to the Mayor of Nuneaton & Bedworth Borough, Councilor Bill Sheppard, for attending the opening of the event. The Mayor sent greeting messages to several stations during the opening ceremony. We are grateful to Nuneaton & Bedworth Borough council for providing for the promotional space in Bedworth Library. The Mayor of Nuneaton & Bedworth Borough, Councilor Bill Sheppard, attended the opening of the event on the 2nd January 2008. 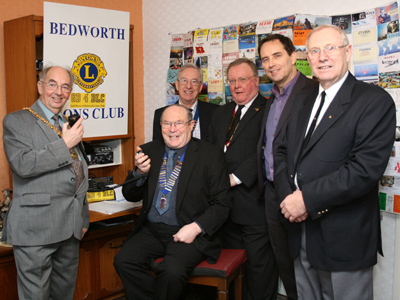 GB4BLC was on the air promoting Bedworth Lions Club both locally and to countries as far away as Kazakstan. A great many contacts were made via AO51 Satellite. We used as many orbits as possible, bringing large amounts of activity. Thanks are due to OFCOM for issuing the Special call sign GB4BLC for 28 days. The RSGB provided information on the GB2RS news service on many occasions. The event was covered in great measure by local newspapers. Thanks to The RSGB & ICOM - U K for providing material about amateur radio. 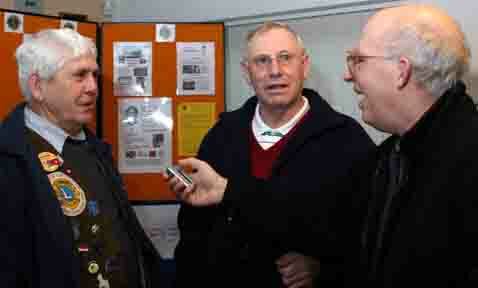 Thanks also to the Coventry Amateur Radio Society for their support. David Monks of Community Broadcasting Service & 'IN TOUCH' - the talking newspaper for the blind - interviewed the participants at the launch of the event, thanks Dave. The club has thanked Lion Brian G8GMU for running this event for the month. Thank you to the Lions who supported this event, and to all the many hundreds of radio stations world wide who made contact with GB4BLC. Roary Lion says..................Communications will improve now the new sunspot cycle has started.